I’ve seen shots of moving cars, and decided to try it. I’ve never done a moving shot before, so on a long drive home, I fiddled with the focus, ISO, and shutter speed, and started taking pictures. 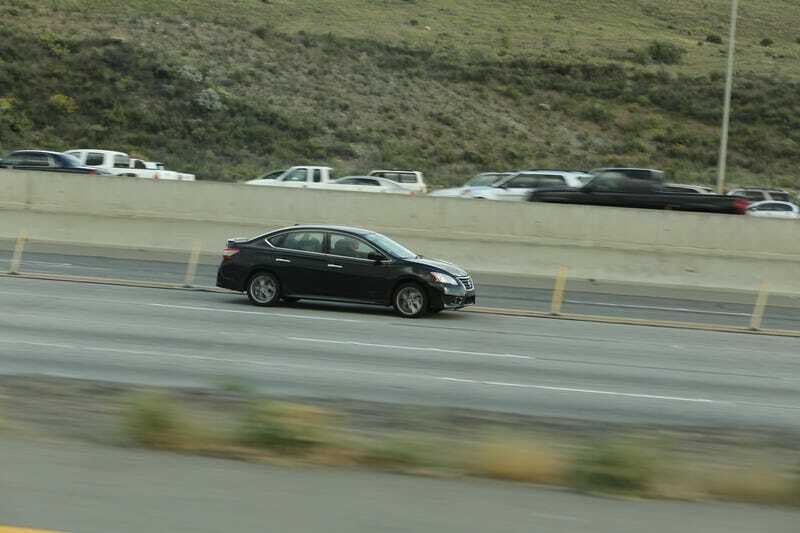 Of course, this being the freeway, I didn’t have the nicest cars to shoot. Feel free to give some tips. The Camry is really nicely focused, but I could have done something to prevent the interior reflections and get less of my car in the shot. It was raining hard for a bit, and I saw the water flowing from the wheel arches of many cars, so I decided to take this picture. I could have focused on the car a bit more, but I’m pretty happy with this shot amd the Sentra shot.